• A list of all decisions taken by Mr. Rao between October 23 and today and after this hour, including transfers of investigations, change of Investigating Officers etc will be furnished to this court in a sealed cover on November 12. The Court also clarified that the entrustment of supervision of investigation to a former SC judge was a "one-time exception which has been felt necessary by this Court in the peculiar circumstances of the case" and that it should not be understood as reflection on any authority of Government of India. The Court has issued notice to the Centre, the CVC and Mr. Asthana on the petitions. 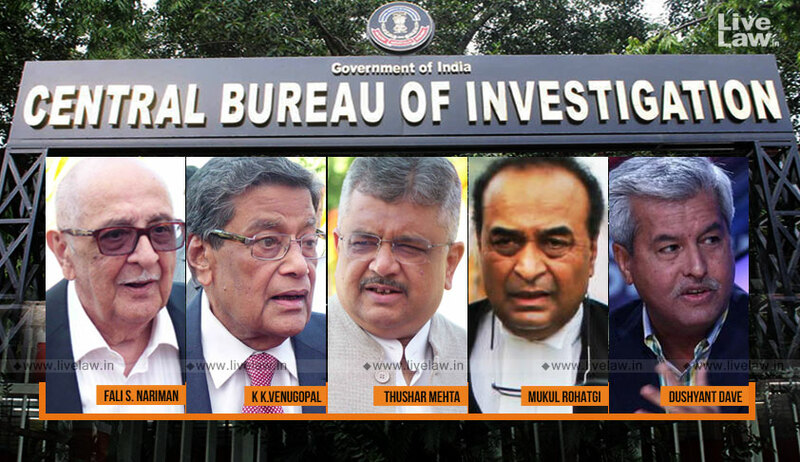 The bench of CJI Ranjan Gogoi, Justice S K Kaul and Justice K M Joseph was considering the petition filed by Alok Verma and PIL filed by NGO Common Cause against the orders of CVC and Central Government divesting Verma of the powers of CBI Director. Senior Advocate Fali S Nariman appeared for Alok Verma. The hearing commenced with Senior Advocate Fali S. Nariman drawing the attention of the bench to the Vineet Narain dictum of the apex court, on insulating the CBI against the government, which was transformed into a Law by virtue of the CVC Act of 2003 and amendments to the Delhi Special Police Establishment Act of 1946. It was his submission that the CBI director is appointed by a High Powered Committee comprising the Prime Minister, Leader of Opposition and the Chief Justice of India as per Section 4A of the DPSE Act. The Director’s tenure has been fixed as two years under the section. For transfer of the CBI Director, section 4B(2) of the Act of 1946 envisages previous consent of the Committee. It is bypassing this Committee that the impugned orders have been passed by the CVC and the Central Government. “we will examine these issues. Today we need to see what interim orders to pass. Without wasting your time, we will tell you what we have in mind....the ongoing inquiry by the CVC with regard to director must be completed within 10 days under the supervision of a judge of this court....the present incumbent as from this moment will not take any policy decisions, only routine work to keep the CBI going....and in a sealed cover, the CBI or the government will give a list of major decisions taken by this incumbent....”, said the Chief Justice at the early stage itself. “Under section 14 (of the CVC Act), the CVC has a different statutory framework. A report has to the work done by the Commission in a year has to be submitted to the President who in turn places it before the Parliament....Please allow only the CVC to examine the matter instead of any other person supervising....”, prayed the SG. On Friday, the bench also refused to hear Senior Advocate Mukul Rohatgi on Mr. Asthana’s challenge to the Central government order of October 23 sending him on leave- “we cannot hear you on something not before us. File a separate writ”. The petition was subsequently filed on the same day. Senior Counsel Dushyant Dave, appearing on behalf of NGO Common Cause, had indicated the CVC’s own approach, in context of Mr. Asthana’s appointment as the CBI Special Director last year, of not taking view of complaints received against an officer at the last instant on the verge of Appointment except in cases of proved misconduct. He also advanced that the present incumbent, Mr. Rao, has transferred officials overnight and sought that the investigations in those matters be protected from being affected. The petition also states that Alok Verma was heading investigation of "highly sensitive cases" including those monitored by the Supreme Court. Verma states in the petition that Rakesh Asthana had "stymied" several decisions which were crucial to the investigation of these cases. He also states that he had reservations against the appointment of Rakesh Asthana as CBI Special Director in view of the cases pending against him. Common Cause's PIL moved by Advocate Prashant Bhushan seeks SC monitored probe into the corruption allegations against CBI top officials. It seeks the removal of Rakesh Asthana from the post of CBI Special Director in view of the recent FIR registered against him on allegation of acceptance of bribe to derail investigation against Moin Qureshi. Common Cause further states that M. Nageshwara Rao IPS, who has been given the charge of CBI Director now following the removal of Alok Verma, is not fit for the job in view of corruption allegations against him.